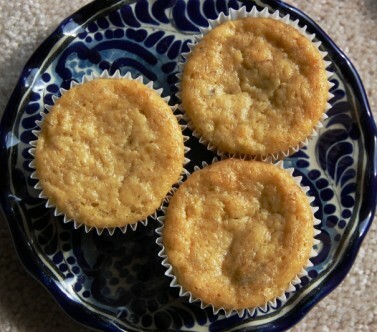 Entries tagged with “banana muffins”. One Month Until I Move…Time to Bake! Comments Off on One Month Until I Move…Time to Bake! Though I’m not in Ireland yet, I decided to start posting here to get a jump-start on my new blog. In exactly one month, I will arrive in Ireland, full of nerves, hope and promise (to get the quick story on why I’m moving go here). In the meantime, I am busy preparing for the big move. One thing I am desperately trying to do is use up all of my pantry food. While I’ll ship a few boxes of spices and maybe even a canned good or two, it’s not feasible to send things like flour, sugar and baking soda so I’m putting them to good use by baking up a storm in my soon-to-be ex-kitchen. Today, I used up all of my agave nectar, a good portion of flour and all three brown bananas that were dying a slow death in my fruit basket. An American in Ireland is powered by	WordPress 4.5.17 and delivered to you in 0.211 seconds using 47 queries.